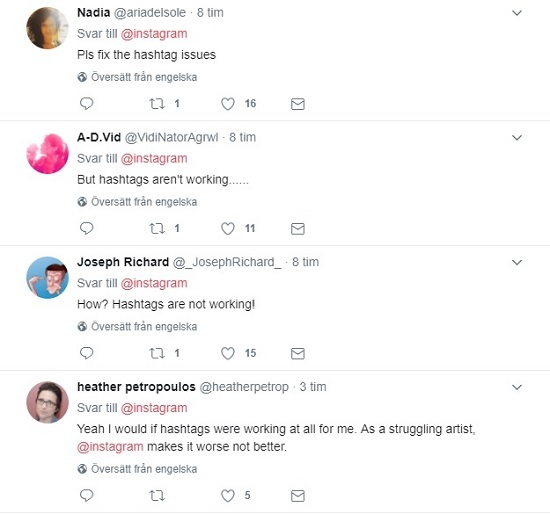 Many users are currently reporting problems with hashtags on Instagram. 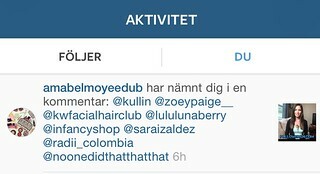 When some users upload photos that are tagged, their photos do not show up under the hashtags they used. I have read about this issue in discussion forums the last few days and yesterday it happened to me as well. I uploaded a photo yesterday evening using about 30 tags, which is the maximum number allowed by Instagram. Normally after I have done this, my photo would immediately show up under the hashtags that I used. But now it didn’t. In fact, on the tags that I had used, almost no new photos from the last hour or so showed up, even on tags where there usually are new photos uploaded every minute, like #reflections. It was soon obvious to me that this was an actual thing, not something that only I noticed in my app. Normally I get a small number of likes, say 10-15, during the first few minutes after uploading a photo. And many of them are from non followers because they discover my photos elsewhere than in their feed. Now, however, notifications were almost silent. Only a single like or two during the first five to ten minutes, and only from followers. This was a clear sign that my photo was only visible to my followers. So I started to investigate. None of the tags I had used displayed almost any recent photos. Some 30-40 minutes ago, some from an hour ago. My photo did not show up anywhere. I logged in to other accounts but the results were the same, even for tags that I had not used in this photo. So had I been shadow banned? I don’t know, the concept of shadow ban is controversial and many experts say it doesn’t exist. Shadow ban is a theory that a user is somehow being punished by Instagram’s algorithm, resulting in their photos not being displayed under hashtags. After about 2-3 hours the problem seemed to have been resolved and my photo was visible again on the hashtags. It even got promoted to the top 9 trending hashtags on more than 10 tags, so clearly all was fine again. It was soon clear that this problem was affecting lots of people. Instagram tweeted out this weekend’s hashtag project and the replies to this tweet are mainly about the tag issue. 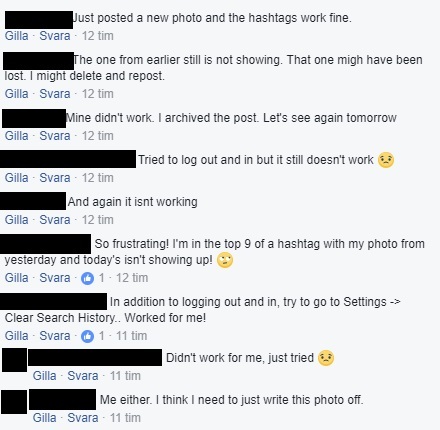 In a Facebook group about social media, people were frustrated because their photos tanked and weren’t displayed at all. There does not seem to be a workaround for users at the moment, should this issue continue. My only recommendation at the moment is to check the hashtags before you publish and see if they are displaying recent photos. If not, maybe you should wait and publish later. Also, check Twitter discussions and see if other people are having the same problem with hashtags. Then at least you will know it is a general Instagram bug and not someting that you did. You’d think by now that people could tell a fake giveaway on Facebook from a real one, but apparently not. There are currently a number of fake car giveaways on Facebook that have gone more or less viral. 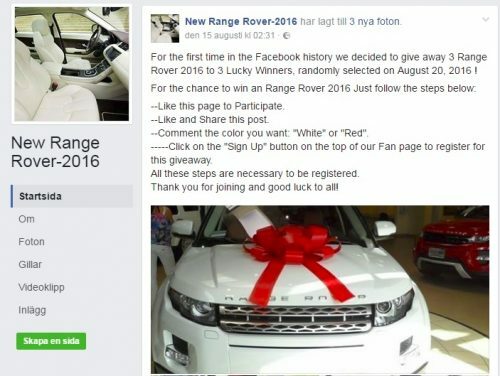 These giveaways often claim to hand out luxury cars to lucky winners and this time there are several scams regarding Range Rover 2016. How do I know they are fake? Well it’s incredibly simple to find out, but a lot of people don’t think or don’t care. 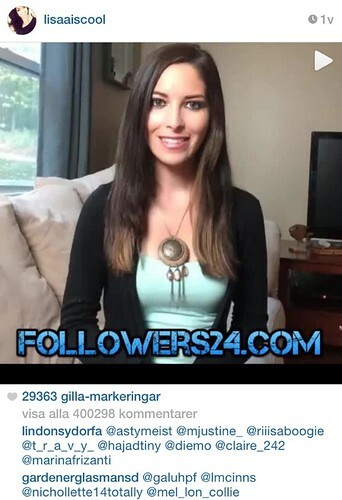 So they participate and help the scammers build up their pages and spam their Facebook friends in the process. The post above has been shared more than 60,000 times and the pages has now more than 30,000 followers. But it is all fake of course. No brand would give away three expensive luxury cars in a simple contest that so blatantly brakes Facebook’s rules. If it’s the very first post on the page: Hoax! If the URL is not a nice and short vanity URL like you’d expect from a large brand: Hoax! So if you or your friends ever wonder how you can avoid falling for hoaxes like these, then maybe you should check my blog post about “How to spot a fake giveaway on Facebook”. In the early 90’s it became possible to trademark buildings in the US so that the use of for example images of the Chrysler Building in New York would be protected. The owners of trademarked building could now stop unlawful commercial use of their buildings on everything from t-shirts to souvenirs. As trademark law evolved, more areas have been subject to trademark protection and for example the New York Port Authority has claimed ownership of images showing the Manhattan skyline. Weird as this may be, it shows the commercial value in owning and protecting a trademark for a famous landmark or place. With that in mind, it is rather strange that social networks are exceptions to the rule that a trademark owner can claim the right to a name. Most social networks distribute account names on a first come first served basis. That is the reason some major brands like Mercedes-Benz own the domain name mercedes.com but the Facebook address www.facebook.com/mercedes belongs to an individual. There is of course a democratic aspect of this approach since it means that everyone has the same chance to register a name and it’s not just about who has the deepest pockets. Maybe you remember how Facebook took away the vanity url “/harman” from Harman Bajwa and gave it to Harman International? A move later reversed by the social network. The other side of the coin is of course that brands stand little chance of being the first to register on every new app or platform that may be the next Twitter. Even if you use external services to keep an eye on such registrations, the management of all this eventually will become expensive and time consuming. Individuals are almost always the first to enter new sites and while some may have a legitimate reason to register a name, many don’t. And once a name has been assigned, it is almost impossible to claim it unless you have a trademark registratation. Even if you do, there are no guarantees that you will get your name back. An area where social network user name policies becomes almost completely unregulated territory is place branding. Countries and city names aren’t necessarily protected trademarks everywhere. I haven’t been able to find out if it is common to have a trademark registration for a city name for example. An effect of this is that a large portion of place names on Instagram have been snatched by individuals instead of for example tourist boards or other official tourist bodies. In fact, none of the 20 largest cities in the US control their actual names on Instagram. Both @newyork and @newyorkcity belong to (unknown) individuals. The unofficial @newyorkcity and @sanfrancisco accounts have 1.2 million and 111,000 followers respectively which means that owning these accounts can be quite lucrative. Four accounts are private and four others are completely inactive with 0 posted images. Half of the 20 accounts have posted 10 images or less. It might seem like a little waste that an account name like @losangeles only have 13 followers (after studying this account for two days it seems that the owner deletes and posts new images every day to keep the account active, three days ago it had 10 images, today it has 3). What to do then? I don’t have definitive answers but I do think there needs to be a debate about this. Account names in social media is real estate, it is part of an infrastructure and a good handle can be of great value much in the same way as a good street address. There has to be a balance between the democratic principle that everyone has the same chance to register and the protection of certain rights holders. 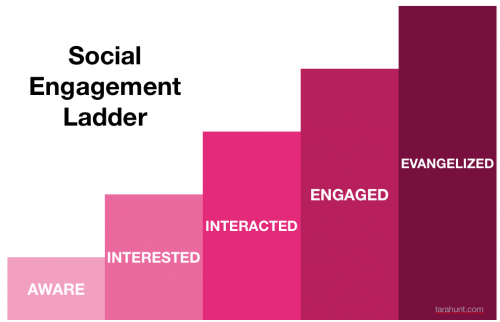 These are the news ways in which people, brands and organizations communicate. If it is easy to find the right account of a city, country or a brand it benefits all users. It should not be possible to register a valuable name and not use it. Inactive accounts should get a notice of cancellation after 12 months of inactivity, with the chance to activate. If not, the account should be terminated. And it should also be possible to apply for inactive names even without a trademark. Social networks need to prevent obvious cases of cybersquatting. For a city like Charlotte, it might not be a surprise that there are others that want to claim the same handle, but in many cases people register these names hoping to benefit in some way. Networks need to work against that. 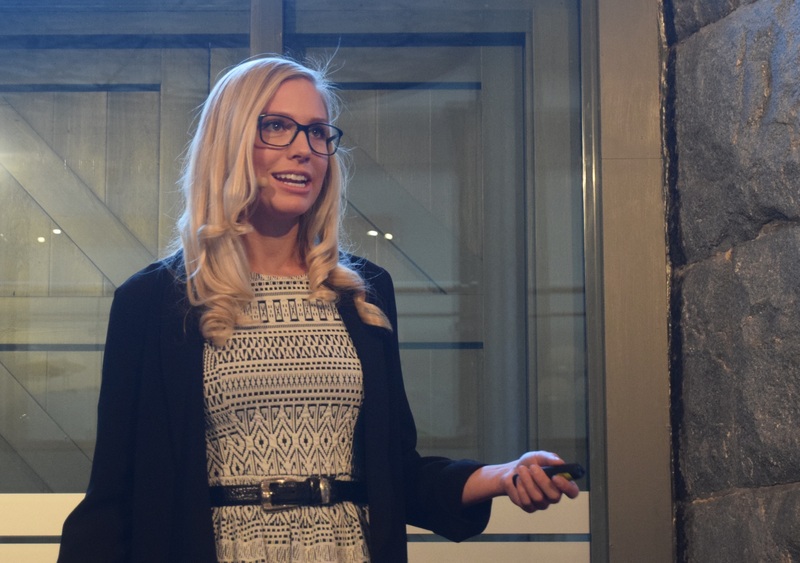 At today’s Rethink conference in Stockholm, Christine Donaldson talked about her experience as an Oakley Women Brand Ambassador. Christine who is a musician and a skier uses social media to create a unique online persona in order to garner the attention of an online audience. She started using Youtube for her music and Instagram to show her passion for skiing. When she began to establish herself as a social influencer, brands began to approach her with suggestions of partnerships. Today she is an ambassador not only for Oakley Women but also for other brands. For someone who is interested in building a personal brand her advice is to find a personal voice and make your content distinguishable from others. From her experience as a brand ambassador, Christine gave the following advice in regards to ambassador programs. When brands start to engage with social influencers they can follow the ladder of social engagement, a model described by Tara Hunt. Read more about that process here. Selfie sticks, those extendable poles that enable users to take selfies beyond the normal reach of the arm, have become incredibly popular. Even the Beckhams use it. But as practical as they are to the user, they can also be annoying to others, for examples at concerts or sports events. 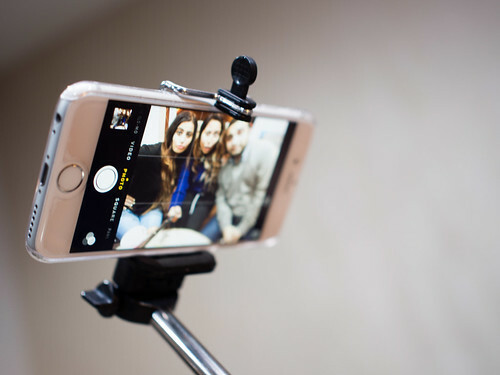 Now several venues have started to introduce restrictions or outright banning the selfie stick. Several major British music venues like O2 Arena and Wembley Arena in London have banned them citing safety and health reasons. More likely the reason is that they may disturb the experience of fellow visitors. “Selfie Sticks are not permitted at Academy Music Group venues. This is in keeping with our existing policy that prohibits the filming and photography during a performance with iPads and other tablet devices and includes any such obstructions for the satisfaction of other customers,” says the owners of the O2 arenas. Sports stadiums like White Hart Lane and Emirates Stadium in London have also imposed bans on selfie sticks. And now there are also restrictions to the use of selfie sticks during the Australian Open in tennis in Melbourne for fear that they may distract players. Others voice concern over the use of the extension pole on for example Disney theme parks and call for restrictions. It may seem ridiculous at first that there is a need for a selfie stick ban, we should be able to handle this by applying common sense, right? And while I’m not a fan of banning, we know that common sense is not all that common. Instead, there is a real risk that the selfie stick becomes a selfish stick when users do everything to get a great photo at the expense of everyone else. With that said, anything could be used inappropriately. Banning sticks is a bit of an overreaction to me. What do you think?